Barefoot Deep Insight (TM) - See What Every Packet is Doing in Your Network. 1. How did it get here? The sequence of switches the packet visited along its path. 2. Why is it here? The set of rules it matched upon at every switch along the way. 3. How long was it delayed? The time it spent buffered in every switch, to the nanosecond. 4. Why was it delayed? The packets, flows, and applications that the packet shared each queue with. Armed with this information, Deep Insight detects almost any anomaly in the network. 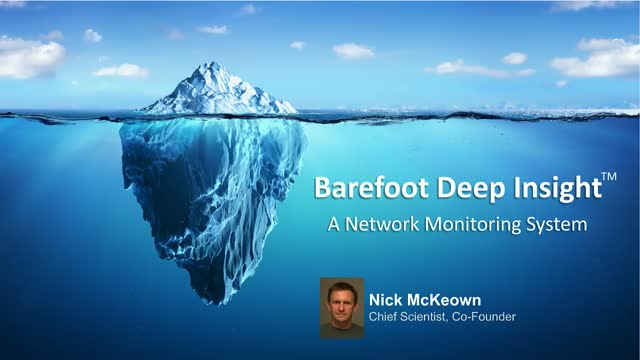 This webinar will cover the concepts used and the technology behind Barefoot Deep Insight network monitoring and analytics system. Barefoot's programmable switch ASICs and P4 language have seen tremendous adoption over the past years, powered by an industry first software development environment allowing end-users to program their silicon. To further accelerate this adoption, Barefoot is introducing P4 Studio(TM) – the next generation software development environment. The new offering makes it easier for customers to not only develop, debug and optimize P4 applications but also to integrate them with the control and management planes. In this webinar, we will dive deeper into the benefits of P4 Studio and technical details of its building blocks including Barefoot P4 Compiler(TM), Barefoot P4 Insight(TM), Barefoot Runtime Interface(TM), and Barefoot Model-Driven Abstraction Interface(TM). We will conclude with a demonstration of new dataplane visualization capabilities introduced with the new SDE. Catch the next wave in networking. Barefoot Networks is a technology company that built Ethernet switching silicon with a forwarding plane that is defined in software while not compromising on performance. Barefoot empowers network owners and their infrastructure partners to design, optimize, and innovate to meet their specific requirements and gain competitive advantage. In combining the P4 programming language with fast programmable switches, Barefoot has also created an ecosystem for compilers, tools, and P4 programs to make P4 accessible to anybody. Backed by Google Inc., Goldman Sachs Principal Strategic Investments, Alibaba, Tencent, and by premier venture capital firms Sequoia Capital, Lightspeed Venture Partners, and Andreessen Horowitz, Barefoot Networks is headquartered in Silicon Valley. Title: Barefoot Deep Insight (TM) - See What Every Packet is Doing in Your Network.